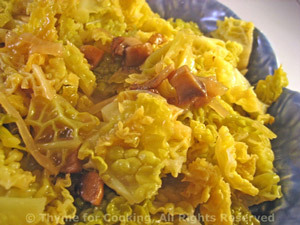 Savoy Cabbage, Onions, Mushrooms, Thyme for Cooking easy side dish. This is an easy sauté of Savoy cabbage and mushrooms. Trim mushrooms and roughly chop. Heat oil in a large nonstick skillet. Add onions, mushrooms, sauté until onions are tender, about 5 minutes. Add cabbage and sauté until it wilts, 5 - 8 minutes. Add chicken stock, cover, reduce heat and cook 10 minutes longer.